“Harassment of women in the streets is usually the girl’s fault.” Those were the words that a young school boy confidently said in a widely shared video by Dignity Without Borders. In the video, school boys spoke about their thoughts on sexual harassment: and the result, while shocking, was a reflection of Egypt’s society. Today, Dignity Without Borders, in a campaign to end ‘sexual terrorism,’ has released a new video of young school girls sharing their experiences and opinions on the sexual harassment endemic. Watch the revealing footage below. To learn more about the outrageous responses and the sad reality that many of Egypt’s women and girls face, Egyptian Streets interviewed 26-year-old María S.Muñoz. María, a Founder at Dignity Without Borders (DWB), arrived in Egypt four years ago to study at the American University of Cairo. What did those, arguably unbelievable, video interviews with the young school boys and girls reveal to you? Are you worried about what they said? María: As you know, we did two videos: in the first one we interviewed boys at a public school in Cairo. In the second one we interviewed girls that were the same age (8 to 15 years old), at a public school too. We saw how in both cases, the fault of sexual harassment is put on girls and women. “If you dress tight clothes, if you have a certain look on your face, if you move too much when walking, harassment is what you should expect. If you dress properly and you behave decently, harassment won’t affect you” That was a common answer for both boys and girls. Girls have been told that they should wear loose clothes, a veil and should lower their gaze when walking on the streets. They listen to their parents and follow their advice, as the children they are, and still get harassed. Yes, eight-year-old girls are subjected to harassment on the streets of Egypt. One of the girls told us with a very assertive tone :”If you wear tight clothes, you will get harassed and go to hell”. We told her, “You wear a veil and loose clothes, do you get harassed?” She responded affirmatively, so we suggested that maybe harassment is not a woman’s fault. She went silent and, probably for the first time in her life, she thought about that possibility. What really worries me is the high probability that these girls will never know they are not responsible for violence against women. It breaks my heart the fact that they will never get to know about their rights, and that they will keep blaming themselves and their daughters about a problem that is entrenched in Egypt’s society and that has very deep roots. Having been in Egypt for a few years now, and heard the responses of those girls in the video, how would you describe life as a woman in Egypt? María: In Egypt, you’re constantly aware about the fact that you are a woman. Your gender becomes your primarily label, and labels are rarely positive. You feel objectified and classified by the way you look, the way you dress and the way you walk. You restraint yourself from smiling and from looking into the eyes of others when you talk. You walk with your headphones on to avoid hearing catcalls and you wear your sunglasses to avoid looks. You measure your skirt carefully and usually take a shawl with you in case you need to cover your shoulders. Yet, sometimes I need to remind myself that I am María who happens to be a woman, and not the other way around. That is when I smile, I look into the eyes of others and I wear headphones, if I want. What inspired you to found ‘Dignity Without Borders’ and when did you first become involved in anti-sexual harassment campaigns in Egypt? María: Sexual harassment affects all women regardless of nationality, dress, age, or socio-economic background. Sexual harassment has also affected me since the first time I came to Egypt and I have always felt extremely concerned about the issue. This concern kept growing until it became a personal issue. In November 2012, I became a co-founder at Tahrir Body Guard: a movement that actively tackled mob assault in Tahrir Square. As a team, we and other groups and organizations, like OPantiSH, Harassmap and Shoft Taharrosh did a lot of work. However, the problem of violence against women in Egypt is much larger and under-explored: female genital mutilation, domestic violence, prostitution and forced marriages are endemic problems that continue to affect the majority of the female population. 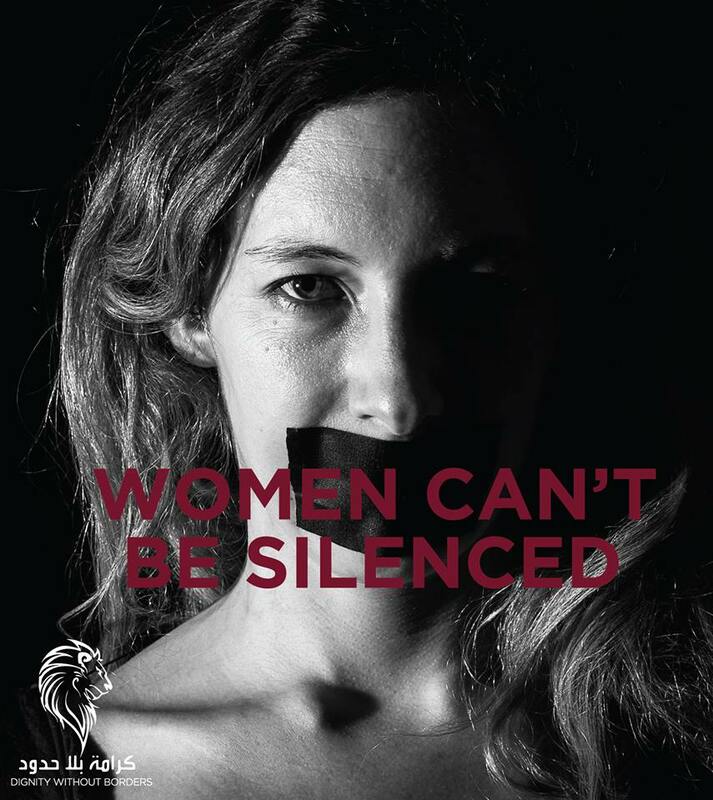 Currently, there are groups of feminists continuously seeking equal rights for women, attempting to move women from being ostracized to positions where they can take part in the public as well as the private spheres. They do an amazing job, but they need help from groups, citizens and authorities. In November 2013, we started DWB as an attempt to work on these core issues that could help alleviate the problem of violence against women. What does DWB aim to achieve? María: Dignity Without Borders in its philosophy and through its efforts endeavors to contribute to an Egypt without sexual terrorism. We are both proactive and reactive in fighting sexual harassment and re-directing public consciousness by providing education, promoting women’s empowerment and raising younger generations towards a culture that strives for justice. We aim to be drivers of positive change, advocating human potential to achieve egalitarian human relations. How has the response to DWB’s activities been? María: The response has always been extremely positive. People are aware of the endemic problem that affects Egypt’s society and most people are willing to cooperate in any way they can. [Today], we are a group of male and female volunteers, Egyptians and non-Egyptians, who dedicate all the time they can to work on the issue of sexual harassment and the larger problem of violence against women. Of course, you will always find hypocrites along the way that either do not acknowledge the issue or blame it on women. What activities or campaigns has DWB initiated? All socio-economic backgrounds need to be more aware of the problems of violence against women and sexual harassment. In our efforts, we try to expand our scope as much as possible, which takes time and determination. It has often been argued that statistics on the rate of female genital mutilation (91 percent of married Egyptian women aged between 15 and 49) in Egypt and of sexual harassment (99 percent) are exaggerated, do you agree? María: This kind of data is very difficult to verify. I would say that, on the contrary, there are still many women who do not dare to say they have experienced sexual harassment or have undergone genital mutilation. I do not think the numbers are exaggerated. This is the sad reality. In your opinion, what needs to be done to improve women’s rights in Egypt? Who is responsible? María: We are all responsible. Law makers, teachers, parents, women and men need to be involved in the process towards equality and mutual respect. We need to call things by their names: sexual harassment is sexual terrorism as long as you are terrorizing someone. Sexual attackers need to be punished and children need to be educated that women, besides being women, are human beings. For anyone interested, how can they get involved with DWB? Hola! I’ve been reading your website for some time now and finally got the bravery to go ahead and give you a shout out from Humble Tx! Just wanted to say keep up the excellent job! Yet another country with the most medieval attitude to women and girls. I don’t think its got much to do with Islam the Quran doesn’t ask for such stupidity and ignorance from men or women. Like Egypt itself,its about infrastructure. You have to educate the male egyptian at home and in school from early age, this can only be done if the mosque is involved and the new government make a stance with policing properly. Good Luck to all involved a long road I fear but very worthwhile cause.